How Can Freelance Writers Craft Beautiful Content For Clients? 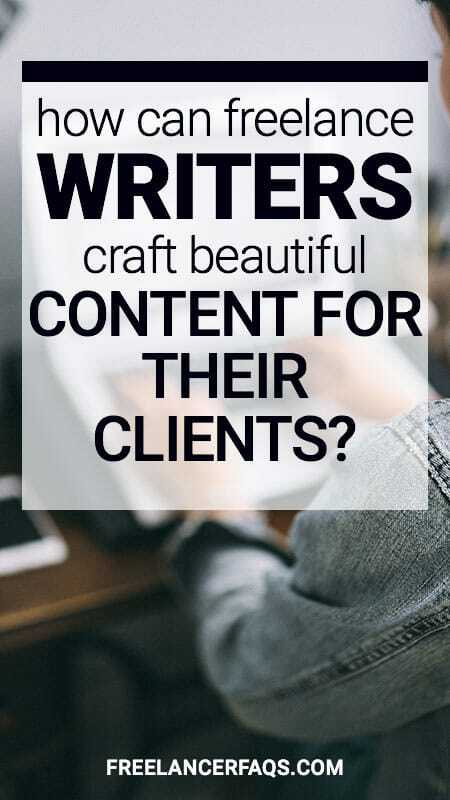 Earlier in my career, one of the main issues I had often suffered with when it came to writing, was crafting content which was easy on the eye and inviting for others to read. In other words, I struggled with creating beautiful content. Initially, I felt as though the appearance didn’t matter and that quality, actionable content was all that was needed to do the job. But as time passed, I realised that I was putting my heart out into my content but I wasn’t seeing any results. Are you struggling with creating beautiful content for your clients? As you could imagine, this was very troubling to me. I didn’t know what was going on but then I began to realise a trend. By devouring tonnes of content from great online marketers and resources of today, I began to see a trend. That trend was the way they formatted their content. It was so easy to read, it just invited you in. It was well spaced, easily scannable with great images and an inviting tone. Little did I know that these were the recipes for success and that I was about to incorporate them into my content crafting. Which now allows me to write beautiful content, both for myself and my clients. From your main heading to all subheadings, one quality that should always be consistent within your content is the quality of your headlines. Your headline’s duty is to draw attention and excitement while being a prelude to what is about to come. A great resource that I have found to generate great headlines is Portent Content Idea Generator. This free tool even uses a bit a science, humour and common sense to generate great ideas that will have you eager to begin writing content and will also entice persons to click and read. Your subheadings are almost of equal importance as they are mostly used as a guide for persons who scan content before reading. Also, sub-headings are great places to insert keywords and assist in optimising your content. If your headings and subheadings are found to not be of any value, your page or post will be deemed useless. So begin today by trying out Portent Content Idea Generator for your next writing assignment. I’m guessing you may have realised already but this article consists of mostly paragraphs containing less than 4 lines. This is because it has been proven to make for easier reading, thus allowing your audience to digest more of what you are saying. Also, it helps with not making persons feel overwhelmed when reading your content. Ask yourself, “how does this article make me feel when reading it?” My intentions are to share actionable tips which you can begin using immediately. Doesn’t it feel as though you can begin to use these tips immediately? Without feeling overwhelmed and frustrated by the article looking as though there is so much advice that it makes you just want to run. This is done by making paragraphs small and sentences short. And is something that you can incorporate into your writing easily and swiftly. H-tags are really to be used to indicate potential keywords which you might want to rank for within your content. But there is also a second major use for H-tags and that is to separate your content. This goes hand in hand with your subheadings as they are to be highlighted using either H3 or H4 tags. This gives heightened clarity to your content, making it a dream for those who like to scan content quickly. This separation adds additional appeal as well as considerable value to your content. On the subject of ease of reading, we have your website background. Now, this is not applicable if you are writing content for a client but for those freelance writers like me, who run personal blogs, a white background with either grey or black type is optimal. Sometimes background colours make content simply too difficult to read. This causes persons to quickly lose interest in your content, no matter how good it really is. I find it to be one of those unnecessary evils which can easily be prevented. We as human are very visual beings. We love images, as well as the brain. Science has proven that images allow us to retain information at a much higher rate than simple words or sounds. Images captivate and paint pictures that might have taken an additional hour or two to write in words. Therefore, when we fully understand the power of images and how to use them, we give ourselves a unique advantage over our competition. Now, this is not always the case for every single image within your content. Some of your images will need to be simple snapshots of a particular thing that you are trying to explain to your audience. Or otherwise but the main thing to do is to ensure that your images are relevant to the content and that they make sense. Tip: If you’re client wants images, make sure you know where to get them and use them. Even though your tone may not directly affect the look of your content, it is still crucial for your readers to feel comfortable when reading it. A nice conversational tone will ensure that your readers don’t feel spoken down too or just spoken too as opposed to it feeling like you are having a conversation with them. This allows for your message to get across while having maximum effectiveness. This helps to build relationships with your readers, encouraging them to accept recommendations, tips and tricks all while increasing your bottom line through conversions. So basically being a win-win for all involved. Crafting beautiful content is much easier than you may think. By following these simple guidelines, you will definitely see a difference in the quality of the work. Even though these laws are meant for freelance writers to use within your own blogging and practice adventures, these will easily translate to your client work over time. It is not difficult and I urge you to implement these changes if you already haven’t and see what difference they can make to your business today. Matthew Parris is a Digital marketer & freelance writer for hire. He offers content writing, ghostwriting, blog & article writing services. His unique style and voice is crafted from his experience in the digital marketing industry. He continually works closely with B2B and B2C businesses, crafting engaging content that is highly attractive to search engines. If he is not working for clients, he is probably enjoying the island life of his sweet little island called Barbados. To find out more about his services, visit ParrisContent.com or if you wish to learn more about Digital Marketing, visit his website Theonlineincomeentrepreneur.com.